This study guide includes 230 multiple-choice and short-answer questions arranged topically for ease of use during the semester, plus an additional set of 20 questions comprising a comprehensive "practice exam." For each multiple-choice question, Professor Rowley provides a detailed answer that indicates which of four options is the best answer and explains thoroughly why that option is better than the other three options. Each short-answer question is designed to be answered in fifteen minutes or less. For these questions, Professor Rowley provides a thoughtful, comprehensive, yet brief model answer. 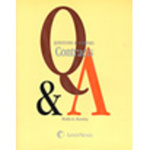 Rowley, Keith A., "Questions & Answers: Contracts" (2006). Books. 47.